Joy Creek Photo Archive (c) all rights reserved We have grown this amazing spreading Pacific Northwest shrub in our rockery for more than 10 years. 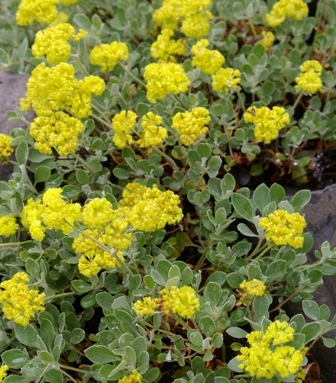 Eriogonum compositum (Form 2) forms a dense evergreen mound covering the gravel and creeping between boulders. In winter, the foliage takes on red highlights. Give this sharp drainage and little summer water. This particular form has gray green foliage. Spring. 2-3 in. x 2 ft.